Exotic Tourists places: Looking for the best destination for spending your leisure time! Consider about picking the top tourist places in India for this summer. All seasons of the year are pleasant in the Indian subcontinent. You can choose the beautiful beaches of the country or the romantic cruises. As well as the mountain resorts that invite tourists with the sublime beauty of the Himalayas. Here are the lists of 15 exotic destinations that you can visit in India for this summer season. If you are searching for the hot spot for spending your holidays away from overcrowding means, Ladakh is the ideal destination. Located in the Himalayas, the valleys of Ladakh filled with sacred Buddhist chants. The monasteries of Ladakh are flashes of colours in the backdrop of mountains of white snow. From the colourful Nubra Valley flowers to the crystal clear waters of the Pangong TSO, Ladakh awakens the poet in you. Navigating the backwaters of Kerala is a memory that will keep for life. Here you can enjoy some exceptional moments with your loved ones. Away from the crowds in the floating houses of Alleppey. Passing through the vast fields of rice, water lilies and listening to the squeaks of numerous birds. This cruise will rejuvenate you. You can go down in the nearby towns to enjoy the authentic cuisine of the state. Such as steamed rice or fish with curry cooked in coconut oil presented in fresh banana leaves. While the beach of the Cochin Sea is the best place to enjoy a magical sunset. The nearby Jewish colonies will transport you back in time. The Jewish synagogue, adorned with Belgian glass windows and spice shops are places where you must go. Instead of being scared of the burning sun, enjoy the warmth of the sun in the mystic mountain resorts of India. Or immerse yourself in the wild waters of the Indian sea. Located in the lap of Pir Panjal and Dauladhar Mountain, Manali is a city of love and life. With its green valleys, its snow-capped mountains and its silver waterfalls. Manali is bestower with the bounties of nature. Rohtang Pass is a perfect destination for nature lovers. Live your dreams in Manali; Fly in paragliding or ride the rapids over the white waters of the Beas River. Immerse yourself in the mysteries of the mountains or enjoy the serenity of Tibetan monasteries and ancient sanctuaries. The soft and warm pashmina shawls and the colourful Himachali tapas are the best that you can take away from Manali. Jammu and Kashmir, located in the foothills of the Himalayas known for its exquisite natural beauty. Live a different life, in the magnificent floating houses of Dal Lake or walk through the Mughal Garden to experience the opulence of the Mughal lifestyle. Adventurous tourists will love the gondola ride over the green valley of Kashmir in Gulmarg. Meanwhile, the blue rivers that flow in the middle of the green fields seem to be a painting fresh from a sketchbook. The relaxing atmosphere of Kashmir also makes it an ideal destination to try Mughlai cuisine; hot butter tea is a welcome respite from the icy breeze. Embroidered dress materials and beautifully carved wooden boxes are lifelong memories that you can purchase here. Northeast India is charming, with its pleasant climate and the warm hospitality of its inhabitants. The mornings in Sikkim are magical, the soft rays of the sun spread over the white snow of Kanchenjunga. And the lines of rhododendron and pine trees offer cool shadows to walk hand in hand with their loved ones. While the extensive tea gardens are a treat for the eyes, a sip of Sikkim’s aromatic tea will refresh you. Walk through the wood and magnolia forest to get close to nature or turn the prayer wheels of the Rumtek Monastery singing Buddhist hymns for a bit of peace. Aurangabad is the city that you have to arrive to start your excursion. 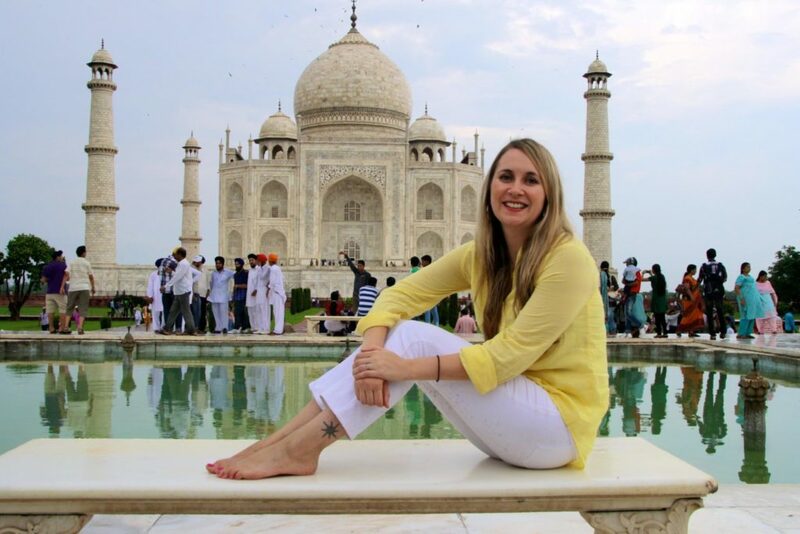 In this city, you can also find the famous “Bibi Ka Maqbara” which is an almost replica of the Taj Mahal, but on a much smaller scale, however, the main attraction is the Ellora caves. This is a complex of temples of different religions (Hindu, Jain, and Buddhist) carved in the mountain. To explain better what it means to carve on the mountain I’ll give you a somewhat simplistic example. Usually when a building gets complete, in this case, a temple. It is a matter of taking several rocks and placing them one on top of the other following the designed plans. 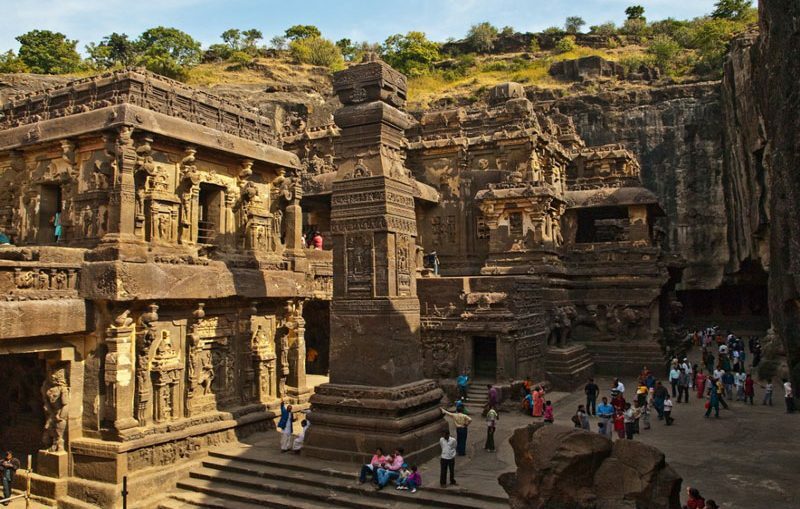 To build the temples of the Ellora Caves, you take a mountain and start digging from top to bottom, giving the shape of the temple in the process. Today this might seem like a not-so-impressive feat to perform but these caves built between the 6th and 9th century with essential tools such as chisels shovels and picks. To put it in perspective, we are talking about 1000 years before what known as the discovery of America. The complex consists of several caves and each one more impressive than the previous one. You will find rock sculptures of real size elephants, several giant Buddha, statues of various deities, among others. Consisting of Raigad, Ratnagiri, and Sindhudurg, the whole stretch of Konkan undergoes a beautiful transformation with the first rains. It is a sight to behold with incredible vegetation all around. In addition to its spectacular natural beauty, Konkan is rich in history. It has an abundance of mountains, forts, and citadels throughout its landscape. And the joy of hiking to the historical remains during the rains is a perfect way to enjoy the weather. To enjoy the monsoons, even more, there are many picturesque beaches in Konkan. You can choose from any of the beautiful beaches of Kashid, Revdanda, Murud, Harihareshwar, Diveagar or Ratnagiri. It is an absolute blessing to visit Konkan for the picturesque beauty of nature and pure happiness of its climate. Rain works like the magic of this splendid place. During August, Udaipur blessed with the small storm. Because the palaces freshly washed from the rain shine, even more, the lush green surroundings that surround them in their best green. The lakes will fill with rainwater and have a Reflection of the impressive palaces, genuinely returning the season of real monsoons. To get the best of Udaipur, go through our suggested tour itinerary of Udaipur. The city of lakes, located between the range of Aravalli and Lake Pichola, has a monsoon palace known as Sajjan Garh Palace. One cannot miss the splendour of the famous Lake Palace which is a must-visit in Udaipur. The Spectacular attraction of Udaipur during August is the Teej festival, marked by the swing of swings, traditional songs and popular number dances. Meanwhile, women love to adorn in the best of their clothes. The charm of Pondicherry is inescapable in summer; the light showers suppress the heat and add to the beauty of its French architecture. It is a perfect time to visit the lovers of the rain and to enjoy the picturesque nature. The sunrise view over the Bengal Bay is breathtaking. One can not only visit Pondicherry and not realise the beauty of its French-inspired buildings. If relaxation is in your mind, then nothing can be better than a walk on the beach. Also, you can take a view of the magnificent sunsets and Sangamam beach or Paradiso Plage that is perfect for that. There are some things to do in Pondicherry for a great travel experience. One of the most delightful things to do during monsoons is to sit in a huge window or a balcony and drink a perfectly prepared hot cup of tea. And more importantly, when it comes to tea, you surely cannot get anything better than Darjeeling tea. The moderate climate, along with a little rain makes the hill town looks serene. And the sound of raindrops falling on the huts with the aroma of persistent tea in the air makes Darjeeling spectacular. During the monsoons sometimes the fog covers the whole place with a dark white blanket and suddenly it is gone. Also, unlike the plains, there is no water log at all, so it’s impressive to take a walk in the rain or enjoy the wet roads afterwards. It is nice to visit Mahabaleshwar during the summer season; the surroundings are at their best green. The charm of the old Mahabaleshwar is the presence of stunning landscapes and temples are like a paradise for any hiking or adventure enthusiast. The famous Pratapgarh fort is a must see here for a breathtaking view of the Konkan coast. Apart from this, several points such as the echo point, sunset point, and monkey point etc. are places to see in Mahabaleshwar. They not only provide a fantastic view but also have local accounts attached to them. While in Mahabaleshwar do not forget to savour the delicious strawberries with cream like strawberries since the fruits grown here are the best in the country. The Monzon magic in Mahabaleshwar describes the beauty of this hypnotising hill station in the best possible way. Munnar has its charm during the rains and is ideal for visiting during the summer. It’s the perfect place where you can find fresh vegetation, tea gardens in bloom and the Chinnakanal waterfalls that are in full force during August. The Eravikulam National Park and the Mattupetty Dam are not to be missing on your checklist. Also, if you happen to visit in summer, then travel a little further to Allepey and participate. Or you can only watch the annual La Nehru Regatta event worth it, which is a show with more than 100 rowers, including the rowing drums of 100 feet long. It also includes the specially designed boat amid frantic local supporters; the energy here simply needs to be witnessed. Being the only hill station in Rajasthan, Mount Abu has nature at its best. It is an ideal escape away from the fiery heat and to enjoy the splendid scenarios around. It is full of lush green mountains, waterfalls and fog. The beautiful Lake Nakki, which is full of water during the rains, the sunset point and the splendid Dilwara Jain Temple are some of the places to visit on Mount Abu. Blessed with natural beauty, the Pahalgam Valley is located at the confluence of the Lidder River and the streams originating from the magnificent Sheshnag Lake. If you are looking to relax in the midst of the mesmerising beauty of Himalayas, then Pahalgam is the ideal place to visit. Pahalgam is the base camp for the spiritual journey renamed to Amarnath. The unexplored rugged terrains are a delight for any nature enthusiast, and a must buy in Pahalgam are the wool products for which is incredibly famous. Khajuraho, often called as the symbol of medieval heritage, has the most impeccable architecture in its impressive temples. Built by the Chandela rulers, it portrays not only his love for craft and art but also his progressivity in thoughts. The sculptures in the temples of Khajuraho represent the innocence of love in various ways, and it proceeds in a very aesthetic way. The Ranch waterfall is radiating with rainwater during this time and the demonstration of light and sound in the temple that highlights its beauty even more. Which you provide list is helpful and useful on summer vacations if you don’t mind add few places visit in India with friends. Thanks for sharing this blog with us.